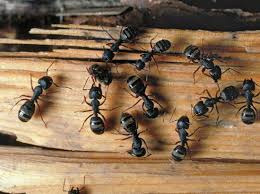 Guardian Pest Control in Snohomish, WA can remove Carpenter Ants, Fire Ants, Sugar Ants, Moisture Ants and House Ants from your residential or commercial structure. Ants are one of the most successful groups of insects. They exhibit 4 distinct life stages; egg, larvae, pupae and adult. About 700 species of ants occur in the United States, with only about 25 of these commonly infesting homes. In the Pacific Northwest, 5 species are of note: carpenter ants, moisture ants, odorous house ants, pavement ants, and pharaoh ants. The biology and habits of these ants may differ, so proper identification is important for a correct control procedure to be initiated. Cost varies depending on size of structure - all work guaranteed! Guardian Pest Control specializes in Carpenter Ant removal throughout Western Washington. An exterior preventive maintenance treatment w/initial inspection ($125 for up to 3,000 sq. ft) is a good cost effective measure to control carpenter ants, moisture ants, house ants and damp wood termites. They're not going away without intervention, but you probably don't have to spend upwards of $500 like most guys will quote, try the $125 treatment first and see how that works for you.